Well, two years later, we may have the answer. After an apparent lull in outflows, potentially driven by the reforms cracking down on capital flight, there are signs that China is facing an exodus of cash once again. As we first reported two weeks ago, amid all the headlines about China's surplus with US and the ongoing trade tensions, there was a message hidden in China's trade data, namely that capital outflow probably accelerated significantly last month. It's a reminder of why the PBOC would probably be reluctant to let the yuan decline significantly. That would encourage even further outflows and risk a vicious circle. While China's total imports plunged 7.6% in dollar terms from a year earlier, its purchases from Hong Kong surged 106%. Only... they didn't, as this has traditionally been the way to "book-keep" China's capital outflows, meaning there isn't really a surge in Hong Kong exports but rather just Chinese importers laundering money by pretending to overpay for Hong Kong exports. Elsa Lignos, global head of FX Strategy at RBC in London, wrote recently that this outlier resembles the jump in 2015-2016 when mainland companies used inflated invoices to take money out of the country. The timing of the sudden shift is telling as it coincides with a lagged reaction to a sudden devaluation - just as we saw in 2015/2016. Now two weeks later, with more detailed information available, we know just how this massive Chinese capital flight is taking place: the answer: precious stones. 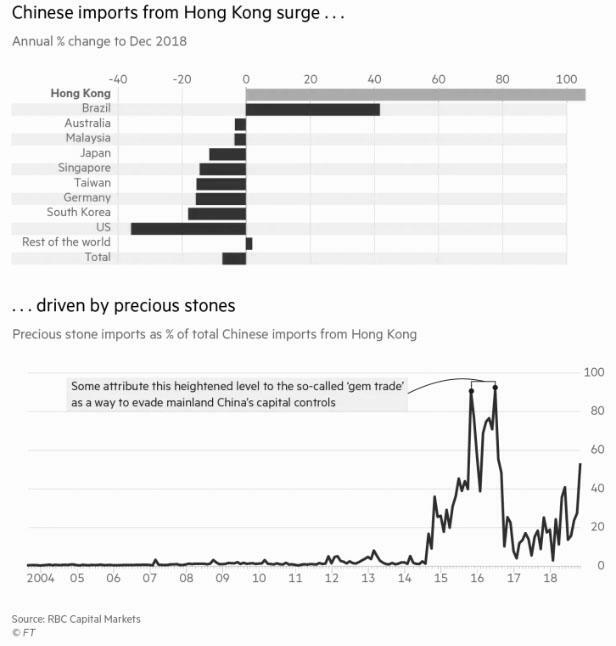 As noted China skeptic Kyle Bass noted yesterday, "wealthy Chinese are running again - precious stones — diamonds, sapphires, etc were 53% China’s total imports from Hong Kong in Nov(up from 2.9% early 2018)." Yet at the same time, the actual sales of jewelry(watches, clocks, and gifts) were down 3.9% in HK same period, or as Bass notes, just like in the period before the 2015 devaluation. 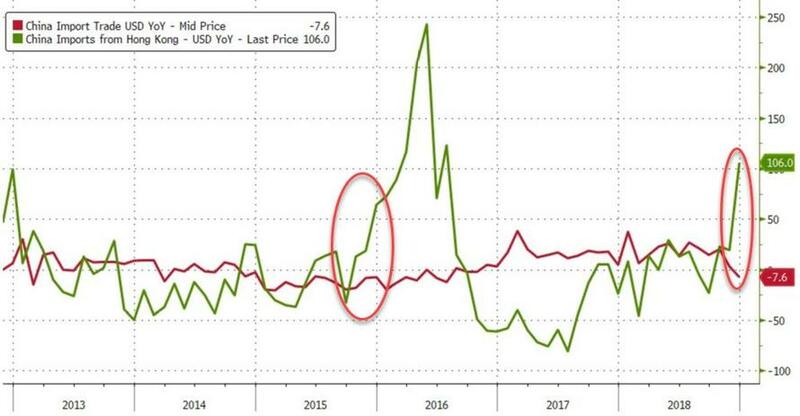 Bass is referring to a follow up report by the abovementioned RBS fx strategist, Elsa Lignos, who not only noted the recent surge in Chinese "imports" from Hong Kong, but more importantly, pointed out a surge in Chinese imports of precious stones from Hong Kong. "In November, for example, precious stones — diamonds, sapphires, opals and the like — accounted for 53 per cent of China’s total imports from Hong Kong, up from a low of just 2.9 per cent last February", she noted according to the FT. Yet at the same time, as Kyle Bass pointed out above, analysts at Jefferies noted that sales of jewellery, watches, clocks and valuable gifts were down 3.9 per cent in Hong Kong in November. That was led by “slower consumption of big-ticket gem-set jewellery” in a market where mainland customers account for about three-quarters of sales. As the FT concludes, correctly, "if some mainlanders are again using the notoriously opaque gem trade to evade capital controls and transfer assets out of China" - which they are - "this may be an ominous sign for the direction of the Chinese currency, and by extension, the economy." The flipside is that at least we know China's depositors are not using Bitcoin to transfer their money offshore... yet. As for what happens next, Bloomberg's Ye Xie points out that as the yuan has appreciated this year, "it would be safe to assume that the urgency for local residents and companies to skirt capital controls and move money out has diminished somewhat." If that is indeed the case, imports from Hong Kong should retreat a bit. However, if China's "imports of precious stones" from Hong Kong accelerate in the months ahead, it will confirm that capital outflow pressure remains persistent and the yuan's strong performance this month will be short-lived; worse it would suggest that at least according to China's local population, another devaluation of the yuan may be imminent.